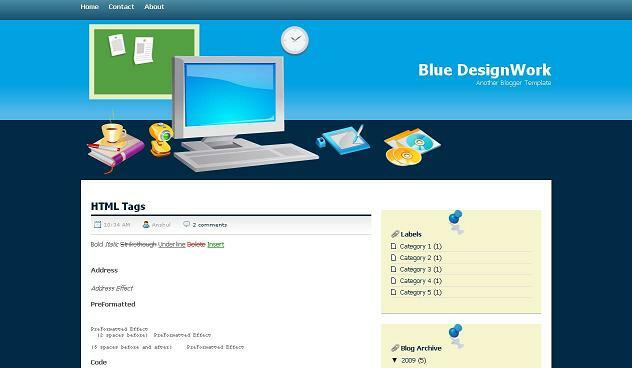 Blue Designwork is a two column blogger template with sidebar to its right and post section to left.The theme is designed by simplywp and converted by me to blogger.The design is simple and looks very nice.Top menu links are ready for you..Seo for title has been done in template.I hope you will like the template for sure.Template support full blogger features.Everything is widgetized and comment system also has been made beautiful.I hope you will like this simple template. Other blogger templates you may like are Skyline At Dusk and NBA. can not display the date of the post? @gustavo just go to settings >formating > Timestamp format > and select the format u like.You can use it as date option.